Let Our Storage Systems Assist Your Facility. 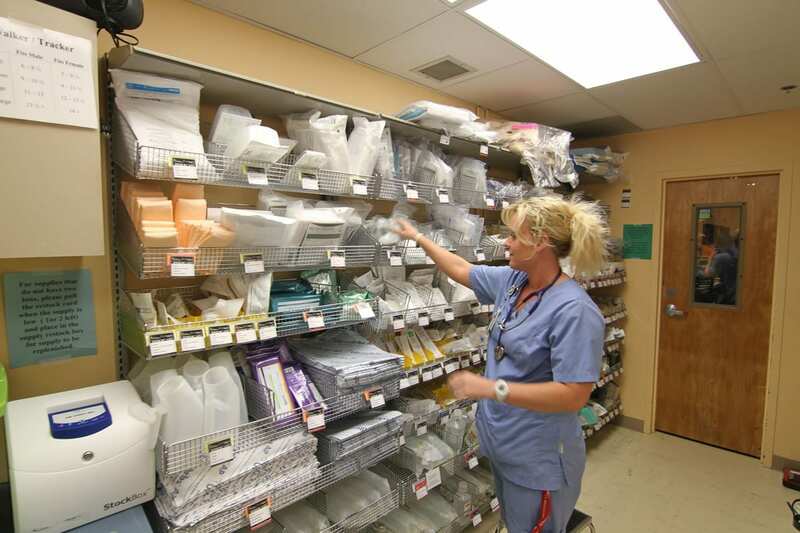 Practicing proper healthcare materials management involves careful planning to ensure supplies are there when needed, yet costs are minimized by avoiding excess inventories. This means that hundreds of different product types and supplies need to be stored, monitored, and rotated to avoid expiration dates and other mishaps. In collaboration with Spacesaver, Hamilton Sorter, and other trusted manufacturers, we design and engineer the storage solutions that work best in your space. By analyzing and taking the supply types, space size and layout, and projected inventory quantities into consideration, we will create a plan and solution for your facility. Our mobile systems are designed to maximize available space and provide quick and easy access to authorized personnel. 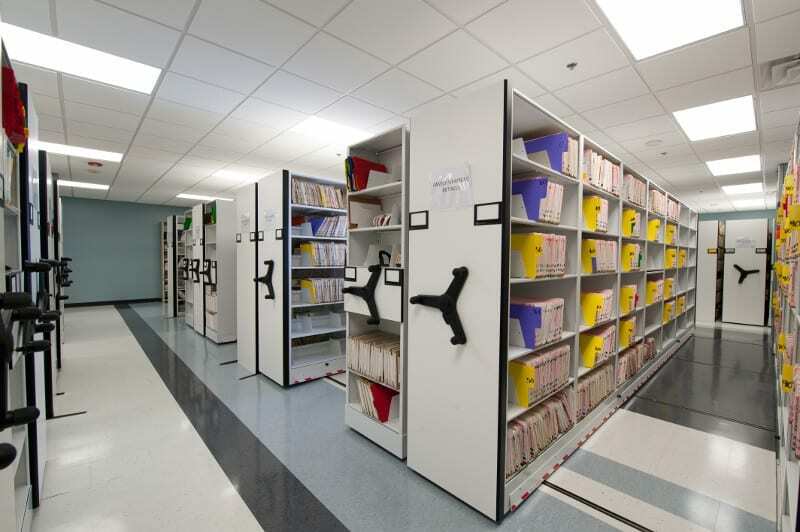 The mobile storage units will allow a smooth and organized healthcare materials management system for your facility. Our modular bin storage, or FrameWRX system is ideal in healthcare applications due to its reconfigurability and extremely visible components. The system was designed to maximize the number of standard-sized color-coded plastic bins that can hang on a unique rail. Having color-coded bins makes your healthcare materials management process quicker and more efficient than traditional storage methods. 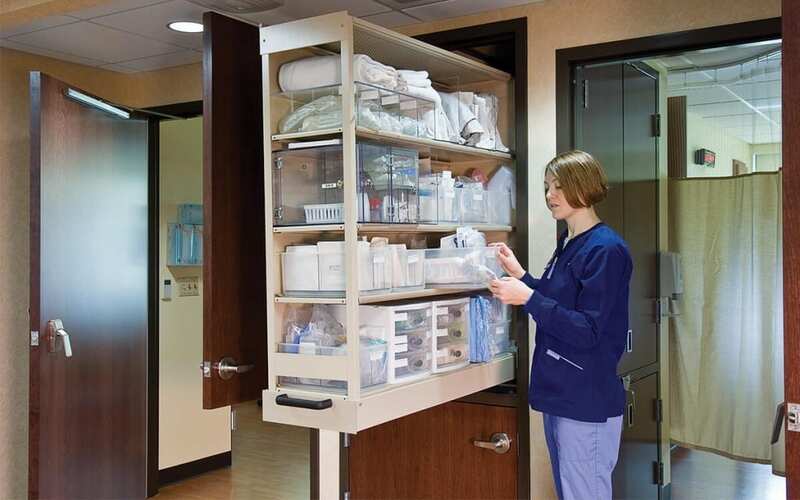 In order to have an effective healthcare materials management system, CoreSTOR Nurse Server by Spacesaver will help ensure materials be right by your nurses’ sides. The nurse server is a supply cabinet that is inside and accessible in the patient’s room but can be stocked from the outside of the room. It puts 80% of your most frequently used supplies steps from your patients’ bedsides. Through our pharmacy line, we can provide work surfaces placed at optimal height, with gravity-feed drawers below and angled shelves above, designed specifically to keep supplies at the staff’s fingertips. 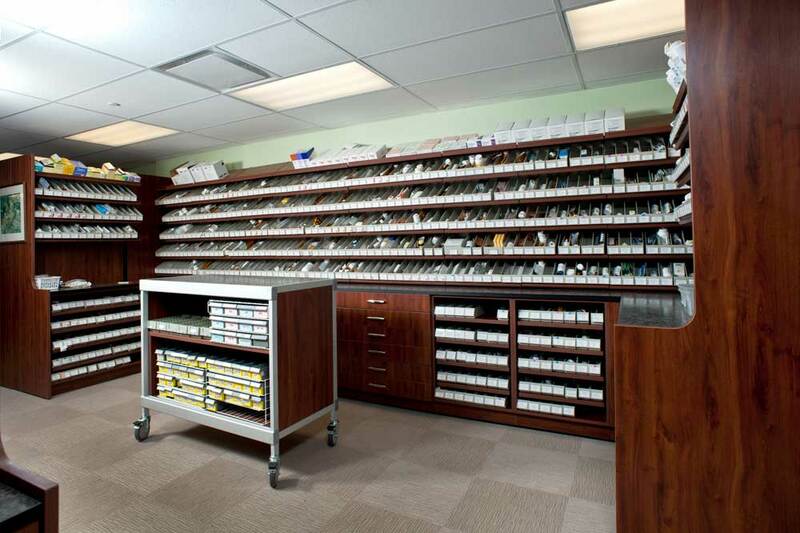 All drawers are available with elective soft-close hardware to significantly reduce noise levels in a busy pharmacy. From work islands to shelving, unit dose fill stations to storage areas, we’re able to customize your pharmacy materials management needs, including the placement of hidden wheels to allow ready mobility and the transfer of materials between areas.